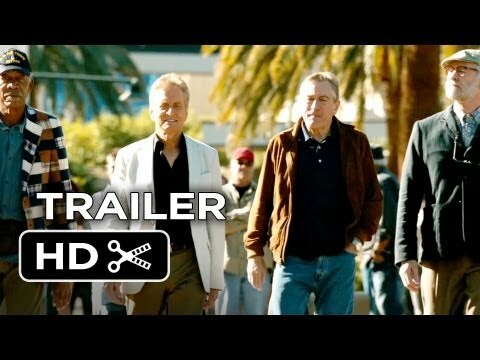 I hope this is the last time we have to see any version of "Last Vegas." Whenever Hollywood smells anything close to success, the money boys jump on it and we have to endure a sequel. I admit that this film has four of my boys; well three out of four. Never been a big fan of Michael Douglas even though I acknowledge that he's done some good work. But I really like Bobby De Niro, Morgan Freeman, and Kevin Kline. These four play childhood friends from Flatbush - Billy, Paddy, Archie, and Sam respectively. Kline is the youngest at 66 and Freeman is the oldest at 76. (Douglas-69; Di Niro-70). And all four of them have won Oscars. Not to be outdone, young Mary "Ted Danson" Steenburgen (age 60), who is the love interest, won an Oscar for Best Actress in a Supporting Role in "Melvin and Howard" (1980). That's a lot of talent on one screen. And Director Jon Turteltaub knowing and understanding this talent pool, merely threw up the ball and let them run with it. The problems was the dull script by Dan Fogelman who also wrote "Crazy, Stupid, Love" (2011). The Executive Producers must have thought that this combo could not miss. And they're right. The Medicare Crowd (f.k.a. Baby Boomers) alone will make this movie profitable. The gray and blue hairs were out in full force for my 2:05 P.M. showing of Last Vegas. Here's the seemingly sweet story: Billy is getting married for the first time so the boys are meeting in Las Vegas for a bachelor party; they pack up their meds and take off from different parts of the country. Mary S. is singing in a sleazy bar and the boys are smitten. Can't miss. Hmmm? I almost walked out, but I felt like the rest of the audience were not even going to the bathroom (and I know they needed to go) so they would not fully appreciate me leaving with popcorn in hand. If you want to see these old farts whoop it up in Las Vegas, then by all means, give it a shot. There's nothing special here. You've been warned. Rock 'n Roll.